As the American G.I.s returned from theatres of war in the Pacific and Europe they realised that all these old cars needed something else so they started playing around with the carburettors, the exhaust and even dropping bigger engines out of newer cars. The trend caught on and with post war America came a lot of abandoned airforce bases which as history will tell you were perfect drag strips to race their souped up 'Hot Rods'. The Ford Model B, also known as 'The Duece' was very popular as it was light, cheap and stronger than earlier models. All car guys know that this is the perfect recipe for building a fun car. Owner of this superb 32 Roadster Lou Falzon sought to keep classic Hot Rod style in-line with the original spirit of Hot Rodding. Loe is running a small block Chevy engine. Companies like Edelbrock and Mooneyes were early adaptors in the Hot Rod scene. These guys set the pace that still remains. Micky Thompson tyres were also very popular with the Hot Rodders. Other trends that still dominate are pinstriping and whitewall tyres. Speed is popular, obviously but these days most Hot Rodders love to cruise and enjoy their rides. Festivals worldwide still attract hundreds if not thousands of entrants and spectators prove that Hot Rodding will be safe for further generations. sell your art online with zazzle. 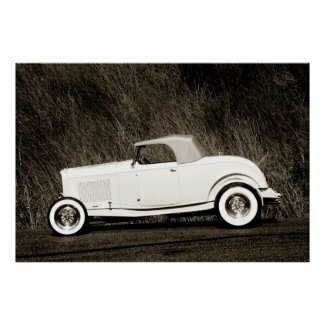 A beautiful film by Whitebird Films with this vintage 1934 B Model Ford speedster.